Objective Wheat gluten and related proteins can trigger an autoimmune enteropathy, known as coeliac disease, in people with genetic susceptibility. However, some individuals experience a range of symptoms in response to wheat ingestion, without the characteristic serological or histological evidence of coeliac disease. The aetiology and mechanism of these symptoms are unknown, and no biomarkers have been identified. 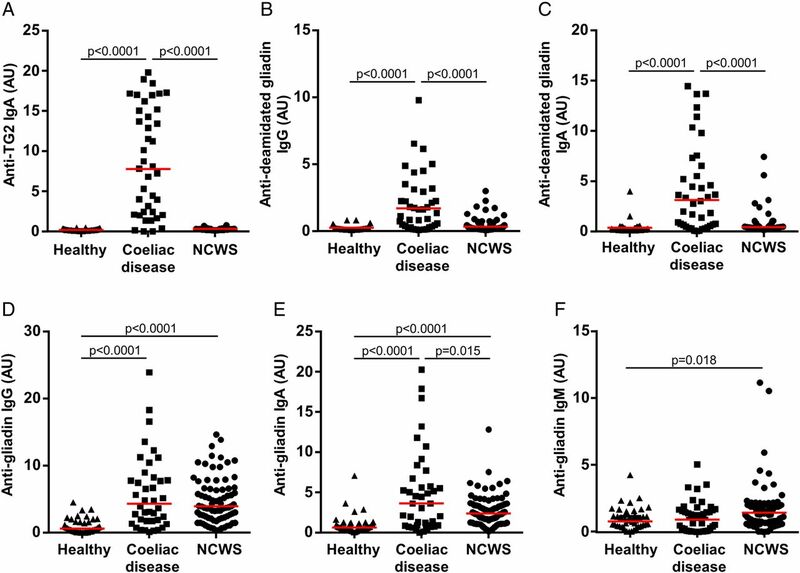 We aimed to determine if sensitivity to wheat in the absence of coeliac disease is associated with systemic immune activation that may be linked to an enteropathy. Design Study participants included individuals who reported symptoms in response to wheat intake and in whom coeliac disease and wheat allergy were ruled out, patients with coeliac disease and healthy controls. Sera were analysed for markers of intestinal cell damage and systemic immune response to microbial components. The potential mechanisms behind the onset of symptoms in NCWS remain unknown, and no biomarkers have been identified.10 However, a small number of studies point to increased antibody reactivity to gluten proteins,5 ,15 ,16 moderately raised intraepithelial lymphocyte numbers,5 ,6 ,17 increased intraepithelial and lamina propria eosinophil infiltration5 and enhanced expression of intestinal tight junction protein claudin 4,16 Toll-like receptor 2 (TLR2)16 or interferon gamma (IFNγ),17 suggesting intercellular junction and immune abnormalities in subsets of affected individuals. Human intestinal epithelial surfaces are colonised by large communities of microorganisms and are in constant contact with an abundance of highly immunogenic microbial products. Compromised intestinal epithelial integrity has been linked to extensive systemic innate and adaptive immune responses that are a consequence of microbial translocation from the lumen into circulation.18 Systemic immune activation in response to microbial translocation is a noted component of HIV infection and IBD.19 In the current study, we investigated (1) whether systemic immune activation in response to translocated microbial products may be a feature of NCWS, (2) whether such systemic immune activation is linked to a compromised intestinal epithelium and (3) whether the systemic immune activation or damage to the epithelium is responsive to the elimination of wheat and related cereals from diet. The study included 80 individuals with NCWS who met the criteria recently proposed by an expert group20 and who were identified using a previously described structured symptom questionnaire21 ,22 (a modified version of the Gastrointestinal Symptom Rating Scale designed to rate symptoms commonly associated with NCWS). All NCWS subjects reported experiencing intestinal and/or extraintestinal symptoms after ingestion of gluten-containing foods, including wheat, rye or barley. The reported symptoms in all subjects improved or disappeared when those foods were withdrawn for a period of 6 months, and recurred when they were re-introduced for a period of up to 1 month. Individuals were excluded if they were already on a restrictive diet in the past 6 months, if they were positive for the coeliac disease-specific IgA anti-endomysial and/or anti-TG2 autoantibody or for intestinal histological findings characteristic of coeliac disease, or if they were positive for wheat allergy-specific IgE serology or skin prick test. A total of six intestinal biopsies, including two from the duodenal bulb and four from the distal duodenum, were taken from each individual. Serum samples from all 80 NCWS subjects while on a diet that contained wheat, rye and/or barley were available. In addition to the above specimens, serum samples were available from 20 of the above NCWS individuals both before and after 6 months of a self-monitored diet free of wheat, rye and barley. These individuals were asked to complete the previously described questionnaire22 before initiating the diet and immediately following its completion. For this study, specific intestinal symptoms (bloating, abdominal pain, diarrhoea, epigastric pain and nausea) and extraintestinal symptoms (fatigue, headache, anxiety, memory and cognitive disturbances, and numbness in arms or legs), selected on the basis of being the most commonly reported symptoms by patients in this population as previously found,6 were considered for analysis. Symptoms were scored from 0 to 3 as follows: 0=absent, 1=occasionally present, 2=frequently present and 3=always present. A total score, based on the sum of individual symptom scores, was calculated for each individual at the two time points (before and after the diet). The study also included 40 serum samples from patients with biopsy-proven active coeliac disease and 40 serum samples from healthy subjects (both groups on normal non-restrictive diet), recruited as part of the same protocol that included the NCWS individuals. All cases of coeliac disease were biopsy proven and diagnosed according to established criteria.23 Screening questionnaires were used to evaluate the general health of unaffected controls. Individuals who had a history of liver disease, liver function blood test results (aspartate transaminase, alanine transaminase, alkaline phosphatase, total protein, albumin, globulin and bilirubin) outside the normal range or a recent infection were excluded from all cohorts in the study. All samples were collected with written informed consent under institutional review board-approved protocols at St. Orsola-Malpighi Hospital, Bologna, Italy. Serum specimens were kept at −80°C to maintain stability. This study was approved by the institutional review board of Columbia University Medical Center. Serum IgG, IgA and IgM antibodies to native gliadin were measured separately by ELISA as previously described,24 ,26 with the following modification: the secondary antibodies were horseradish peroxidase (HRP)-conjugated anti-human IgG (GE Healthcare), IgA (MP Biomedicals) or IgM (MP Biomedicals). Serum IgG, IgA and IgM antibodies to bacterial flagellin were measured separately using a similar protocol for detecting antibodies to gliadin, with the following modification: plates were coated with a 2 μg/mL solution of highly purified flagellin from Salmonella typhimurium (InvivoGen). Levels of serum IgG, IgA and IgM endotoxin-core antibodies (EndoCAb) (Hycult Biotech), lipopolysaccharide (LPS)-binding protein (LBP) (Hycult Biotech), soluble CD14 (sCD14) (R&D Systems) and fatty acid-binding protein 2 (FABP2) (R&D Systems) were determined by ELISA, according to the manufacturers' protocols. Group differences were analysed by the Kruskal-Wallis one-way analysis of variance, with post hoc testing and correction for multiple comparisons. Correlation analysis was performed using Spearman's r. A multivariate principal component analysis (PCA) was carried out on the entire dataset to reduce data dimensionality and to assess clustering. The effect of the restrictive diet was assessed by the Wilcoxon matched-pairs test. All p values were two sided, and differences were considered statistically significant at p<0.05. Statistical analyses were performed with Prism 6 (GraphPad) and Minitab 17 (Minitab) software. The demographic and clinical characteristics of the study cohorts are included in table 1. Twenty-one (26%) NCWS individuals expressed HLA DQ2 and/or DQ8, a rate not substantially different than in the general population. Small intestine duodenal biopsy showed a normal mucosa (Marsh 0) in 48 (60%) and mild abnormalities, represented by an increased intraepithelial lymphocyte number (Marsh 1) in 32 (40%). In contrast, all patients with coeliac disease in this study expressed HLA DQ2 and/or DQ8 and presented with Marsh 3 grade intestinal histological findings. The active coeliac disease cohort exhibited significantly elevated IgA antibody reactivity to TG2, as well as IgG and IgA antibody reactivity to deamidated gliadin, when compared with healthy controls (p<0.0001 for each comparison) (figure 1A–C). 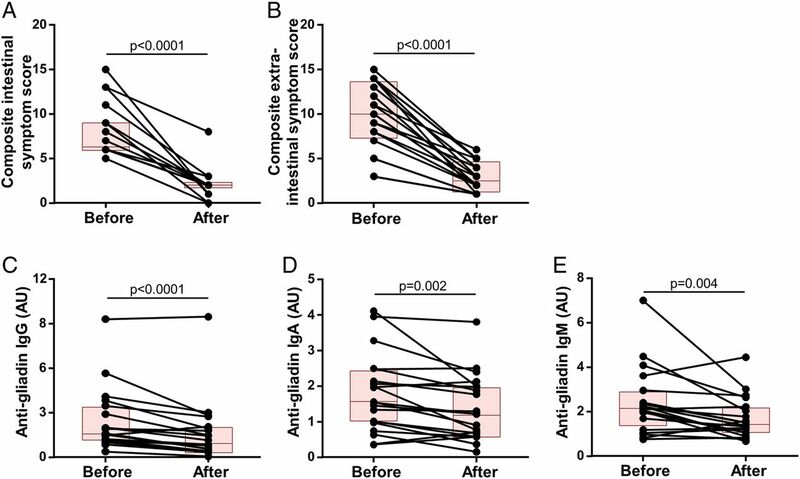 Patients with coeliac disease also displayed increased IgG and IgA (p<0.0001 for each), but not IgM, antibody reactivity to native gliadin when compared with healthy controls (figure 1D–F). In the NCWS cohort (while being on a diet that did not restrict the intake of wheat and related cereals), IgG, IgA and IgM antibodies to native gliadin were all significantly higher than in the healthy control group (p<0.0001, p<0.0001 and p=0.018, respectively) (figure 1D–F). However, IgA reactivity to native gliadin in this NCWS cohort was lower than in the coeliac disease group (p=0.015). There was no association between antibody reactivity to native gliadin and the presence of HLA DQ2 and/or DQ8 genotypes in the NCWS group. Markers of coeliac disease and immune reactivity to wheat gluten. Serum levels of (A) IgA antibody to transglutaminase 2 (TG2), (B) IgG antibody to deamidated gliadin, (C) IgA antibody to deamidated gliadin, (D) IgG antibody to native gliadin, (E) IgA antibody to native gliadin and (F) IgM antibody to native gliadin in cohorts of healthy controls, patients with coeliac disease and individuals identified as having non-coeliac wheat sensitivity (NCWS). Horizontal red lines indicate the median for each cohort. Serum levels of both LBP and sCD14 were significantly elevated in individuals with NCWS in comparison with patients with coeliac disease and healthy individuals (p<0.0001 for each comparison) (figure 2A, B). There was a highly significant correlation between serum LBP and sCD14 (r=0.657, p<0.0001) (see online supplementary figure S1). Neither LBP nor sCD14 was found to be significantly elevated in patients with coeliac disease when compared with healthy controls. Markers of systemic immune response to microbial components. 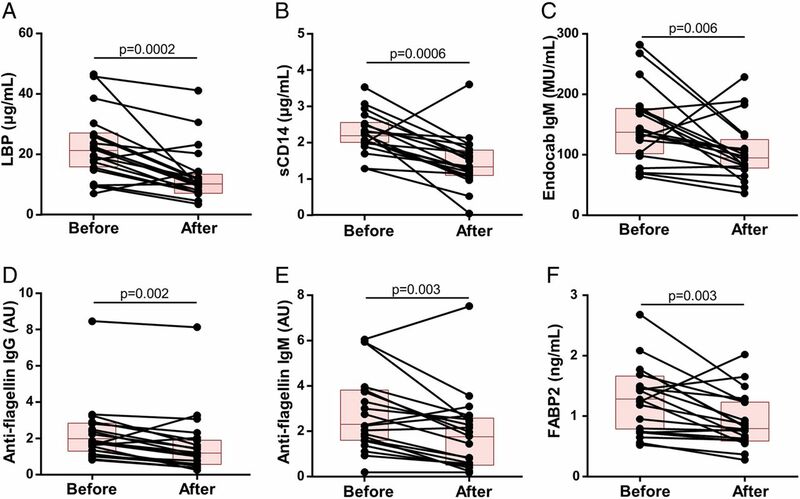 Serum levels of (A) lipopolysaccharide-binding protein (LBP), (B) soluble CD14 (sCD14), (C) endotoxin-core antibodies (EndoCAb) IgG, (D) EndoCAb IgM, (E) IgG antibody to flagellin and (F) IgM antibody to flagellin in cohorts of healthy controls, patients with coeliac disease and individuals with non-coeliac wheat sensitivity (NCWS). Horizontal red lines indicate the median for each cohort. When compared with the healthy control and coeliac disease cohorts, the NCWS group had significantly higher levels of EndoCAb IgM (p<0.0001 and p=0.028, respectively) (figure 2D), but not IgG or IgA (see figure 2C and online supplementary figure S2A). 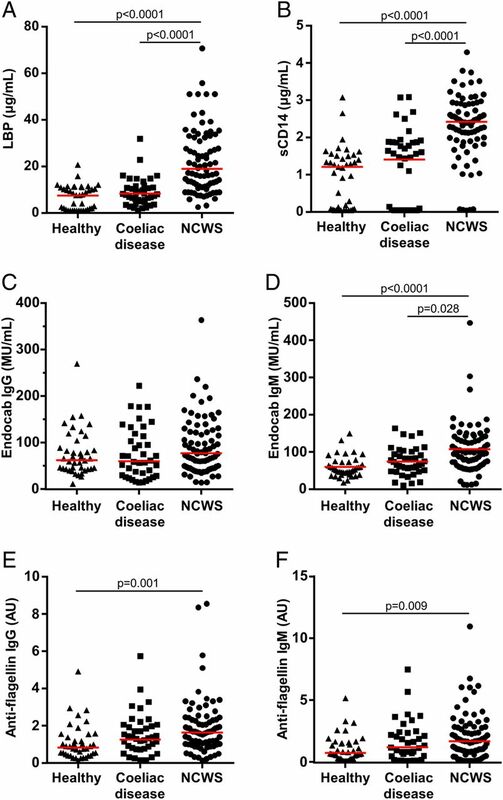 In contrast to the NCWS cohort, the coeliac disease group had higher levels of EndoCAb IgA when compared with the NCWS and healthy control groups (p=0.021 and p=0.032, respectively) (see online supplementary figure S2A), but not IgG or IgM (figure 2C, D). In comparison with the healthy control group, serum concentrations of FABP2, a marker of intestinal epithelial cell damage, were significantly elevated in the NCWS cohort, as well as in the coeliac disease group (p<0.0001 for each) (figure 3A). In addition, the FABP2 concentrations in the NCWS cohort correlated with levels of LBP (r=0.360, p=0.001) and sCD14 (r=0.461, p<0.0001) (figure 3B, C). The FABP2 concentrations in the NCWS group also correlated with EndoCAb IgM (r=0.305, p=0.003) and anti-flagellin IgM antibody reactivity (r=0.239, p=0.033) in the NCWS cohort (see online supplementary figure S4A, B). In the coeliac disease cohort, FABP2 concentrations correlated with the levels of IgA antibody to TG2 (r=0.559, p<0.0001) (see online supplementary figure S5). Intestinal epithelial cell damage and correlation with systemic immune activation. (A) Serum levels of fatty acid-binding protein 2 (FABP2) in cohorts of healthy controls, patients with coeliac disease and individuals identified as having non-coeliac wheat sensitivity (NCWS). (B and C) Correlation of serum levels of FABP2 with lipopolysaccharide-binding protein (LBP) (B) and soluble CD14 (sCD14) (C) in individuals with NCWS. Horizontal red lines indicate the median for each cohort. PCA was used to assess similarities and differences between the subjects in the three cohorts based on the generated data and to determine whether they can be grouped. Most of the variability in the data could be explained by the first two components (54%). 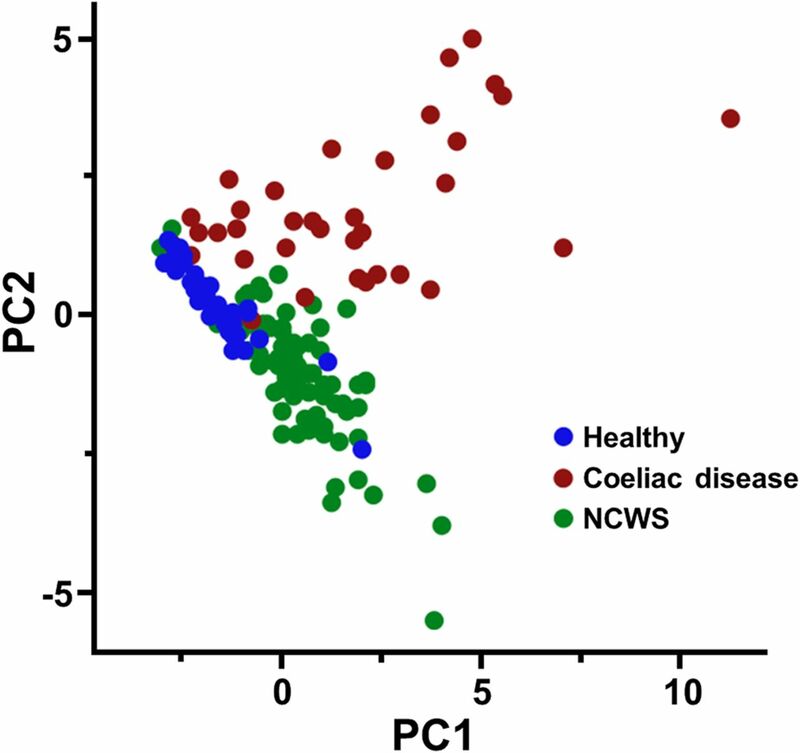 The score plot of the first and second components for the entire dataset demonstrated the clustering of the healthy control, coeliac disease and NCWS subjects into three discernible groups, with some outliers (figure 4). Principal component analysis (PCA) score plot for the complete dataset of serological markers (anti-transglutaminase 2 (anti-TG2) IgA; anti-deamidated gliadin IgG and IgA; anti-gliadin IgG, IgA and IgM; lipopolysaccharide-binding protein (LBP); soluble CD14 (sCD14); endotoxin-core antibodies (EndoCAb) IgG, IgA and IgM; anti-flagellin IgG, IgA and IgM; and fatty acid-binding protein 2 (FABP2)) measured in healthy controls, patients with coeliac disease and individuals with non-coeliac wheat sensitivity (NCWS). Subjects are plotted in two dimensions using the first and second principal components (PC1 and PC2). Levels of the above markers of immune activation and gut epithelial cell damage were also measured in 20 of the above NCWS subjects before and 6 months after initiation of a diet free of wheat, rye and barley. All individuals reported symptom improvement at the end of 6 months, which was reflected in a significant reduction in both the intestinal and extraintestinal composite symptom scores (p<0.0001 for each) (figure 5A, B), accompanied by a decline in IgG, IgA and IgM anti-gliadin antibodies (p<0.0001, p=0.002 and p=0.004, respectively) (figure 5C–E). In conjunction with this, we found a statistically significant reduction in the serum levels of LBP (p=0.0002), sCD14 (p=0.0006), EndoCAb IgM (p=0.006), anti-flagellin IgG and IgM antibodies (p=0.002 and p=0.003, respectively) and FABP2 (p=0.003) after the completion of the diet (figure 6A–F). The magnitude of change in the measured biological markers did not correlate significantly with that for the symptom scores. Symptoms and anti-gliadin antibody reactivity in response to the restrictive diet. (A and B) Composite scores for intestinal symptoms (bloating, abdominal pain, diarrhoea, epigastric pain and nausea) and extraintestinal symptoms (fatigue, headache, anxiety, memory and/or cognitive disturbances, and numbness in arms and/or legs) before and after 6 months of a diet free of wheat, rye and barley in a cohort of 20 patients with non-coeliac wheat sensitivity (NCWS). (C–E) Levels of IgG, IgA and IgM antibody to gliadin proteins before and 6 months after starting the diet in the NCWS cohort. Each individual is represented by a dot and the two points corresponding to the same individual are connected by a line. Each box indicates the 25th–75th percentiles of distribution, with the horizontal line inside the box representing the median. Markers of intestinal epithelial cell damage and systemic immune activation in response to the restrictive diet. (A–F) Levels of lipopolysaccharide-binding protein (LBP), soluble CD14 (sCD14), endotoxin-core antibodies (EndoCAb) IgM, anti-flagellin IgG, anti-flagellin IgM and fatty acid-binding protein 2 (FABP2) before and after 6 months of a diet free of wheat, rye and barley in the cohort of 20 patients with non-coeliac wheat sensitivity (NCWS). Each individual is represented by a dot and the two points corresponding to the same individual are connected by a line. Each box indicates the 25th–75th percentiles of distribution, with the horizontal line inside the box representing the median. Subsequently, we considered whether the observed systemic immune activation in response to microbial products in individuals with NCWS may be linked to increased intestinal enterocyte damage and turnover rate. FABP2 is a cytosolic protein specific to intestinal epithelial cells that is rapidly released into systemic circulation after cellular damage.32 Alterations in circulating FABP2 concentration, reflecting epithelial cell loss and changes in enterocyte turnover rate, are useful for identifying acute intestinal injury.32–35 Elevated circulating FABP2 has been shown to be associated with increasing degrees of villous atrophy in coeliac disease,36 and with microbial translocation in HIV37 that is in turn linked to damaged intestinal epithelial barrier integrity.18 Similar to the patients with coeliac disease, the NCWS individuals in this study were found to have raised circulating FABP2 levels, indicating increased intestinal epithelial cell damage. FABP2 concentrations in the NCWS cohort correlated strongly with levels of LBP and sCD14, suggesting a link between the intestinal epithelial cell damage and the acute systemic immune activation in response to translocated microbial products. The FABP2 concentrations in the NCWS group also correlated with IgM antibody reactivity towards microbial antigens, though less strongly in comparison with LBP and sCD14 responses, as might be expected for a systemic antibody response. In the coeliac disease cohort, FABP2 concentrations correlated with the increased IgA antibody to TG2, confirming the existence of a close relationship between the mucosal autoimmune response and the intestinal damage in this disease. On the other hand, despite the established extensive villous damage associated with coeliac disease, neither LBP nor sCD14 levels were found to be significantly elevated in the coeliac disease group, thus standing in stark contrast to the NCWS cohort. In addition, among the immunoglobulin responses to microbial antigens, only IgA antibodies appeared to be increased in coeliac disease. These data suggest that there is an effective mechanism for the neutralisation of microbial products that may cross into the lamina propria in most cases of coeliac disease, possibly in part via the localised IgA response and mucosal phagocytic cells. These mechanisms are known to be essential for the immune surveillance of luminal antigens and the elimination of microbial products that cross the epithelial barrier, thereby reducing the likelihood of their translocation into the submucosa and access to blood vessels.19 Such mucosal immune responses may be lacking or inadequate in individuals with NCWS. Instead, what we observed were enhanced IgM responses to gliadin, LPS and flagellin in the NCWS cohort, which clearly contrasted with the coeliac disease group. In humans, IgM memory B cells are present in the peripheral blood and contribute to the expression of IgM antibodies to a diverse variety of antigens, offering a first line of defence against potential pathogens.42 Exposure to unmethylated CpG sequences, which are abundant in the bacterial and viral genomes, can result in TLR9-dependent proliferation and differentiation of these B cells, independent of direct interaction with their respective antigens or T-cell involvement.43 Acute microbial translocation from the gut, as the data from our study suggest, would be expected to enhance the secretion of IgM antibodies in the periphery via this pathway. These IgM B cells would be additionally stimulated on encounter with specific antigens, such as the translocated microbial components or gliadin sequences, and may contribute to the observed IgM antibody responses.43 ,44 Recognition and agglutination of antigens by IgM and IgG antibodies can result in the activation of the classical complement pathway and Fc receptor-mediated endocytosis by macrophages,45 further contributing to the ongoing systemic immune response. The authors thank Dr Timothy C Wang (Columbia University) and Dr Donald D Kasarda (US Department of Agriculture) for the critical review and discussion of the manuscript. The authors are also grateful to Dr Benjamin Lebwohl and Dr Daniel E Freedberg (Columbia University) for insightful discussions and input during the course of the study.
. Endogenous endotoxin-core antibody (EndoCAb) as a marker of endotoxin exposure and a prognostic indicator: a review. Prog Clin Biol Res 1995;392:263–72.
. Intestinal-type and liver-type fatty acid-binding protein in the intestine. Tissue distribution and clinical utility. Clin Biochem 2003;36:529–35.
. Developmental and structural studies of an intracellular lipid binding protein expressed in the ileal epithelium. J Biol Chem 1990;265:19199–207.
. Effects of infection with transmissible gastroenteritis virus on concomitant immune responses to dietary and injected antigens. Clin Diagn Lab Immunol 2004;11:337–43. Contributors AA had full access to all of the data in the study and takes responsibility for the integrity of the data and the accuracy of the data analysis. AA: study concept and design. MU, MA, GC, RDG, AI, ECV, PHG, UV and AA: contribution to study design. MU, MA, GC, RDG, AI and UV: acquisition of data. MU, MA, GC, RDG, AI, ECV, PHG, UV and AA: analysis and interpretation of data. MU and AA: drafting of the manuscript. MU, MA, GC, RDG, PHG, ECV, UV and AA: critical revision of the manuscript for important intellectual content. MU and AA: statistical analysis. GC, RDG, ECV, PHG, UV and AA: administrative, technical or material support. AA: obtained funding. AA: study supervision. Funding This study was supported by the National Center for Advancing Translational Sciences, National Institutes of Health, through grant number UL1 TR000040 (to AA) and The Stanley Medical Research Institute through grant number 08R-2061 (to AA). Additional support was provided by the Italian Ministry of University, Research and Education through grant number 2009MFSXNZ_002 (to RDG), the Italian Ministry of Public Health through Ricerca Finalizzata Regione Emilia Romagna-2009 (to RDG), and funds from the University of Bologna. The funding agencies had no role in the design and conduct of the study; in the collection, analysis and interpretation of the data; or in the preparation, review or approval of the manuscript. Ethics approval Institutional Review Board of Columbia University Medical Center. Non-coeliac gluten sensitivity: are we closer to separating the wheat from the chaff?